Tourism presents a strategic avenue for just peace advocacy in Palestine and Israel. PIEF has worked to promote pilgrimages of transformation by supporting the establishment of guidelines and a Code of Conduct for Tourism in the Holy Land based on biblical perspectives. Locals, tourists and believers mingle on Via Dolorosa on Good Friday. PIEF is part of a growing movement of people and groups in Palestine, Israel and around the world that share the conviction that pilgrimages to The Holy Land should seek encounters with local Palestinian Christians as a response to the call of the gospel to "come and see". Thus, pilgrims themselves can be transformed and become instruments for and witnesses to peace and justice upon their return. Written by a group of theologians, Palestinian Christian activists and professionals in the tourism industry, these guidelines are a call to Christian pilgrims to live their faith as they visit the Holy Land. A pilgrimage, they suggest, should go beyond an homage to ancient sites. 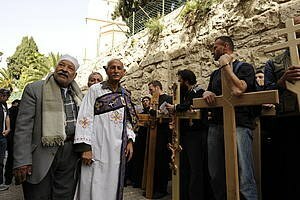 Visitors should seek authentic, face-to-face human encounters with the people living in the Holy Land, especially the Palestinian Christians – the “Living Stones” who share their faith. The guidelines contain tools including Biblical reflection and a Code of Conduct for Tourists in the Holy Land to help plan and prepare – practically and spiritually – a "pilgrimage of transformation". Leading from Nazareth to Bethlehem, the Nativity Trail provides and opportunity to walk in the footsteps of Mary and Joseph, calling in on monasteries and mosques, villagers' homes and bedouin tents. The hikes are organized by the Siraj Center for Holy Land Studies and the Alternative Tourism Group (ATG), and led by professional local guides. "The Nativity Trial is not just a trip; it is a journey of dialogue, openness and interaction with new people." Alternative Tourism group (ATG) invites you to a journey of truth and transformation that will reveal the love of God to you through the eyes of the Palestinian people who, despite having suffered decades of occupation and dispossession-- maintain their dignity, faith, and capacity for hope. Read more.. There is no country on earth that monopolizes tourism the same way Israel does. Israel knows that tourism is its window to the world: a first, powerful glimpse onto the image it wishes to project, as well as a way to shape and control this image. In this sense, tourism is also a tool that Israel uses to market itself as a civilized democratic country. Most countries use tourism to market themselves; when it comes to this general purpose, I don’t mind too much. But, in the case of Israel, its strategy is not to market itself; rather, it works to demonize the Palestinians, vilifying their narrative and stripping them of the places, resources and rights involved in telling it. During the past decades, Israel has actively prevented Palestinians from taking the initiative, let alone the lead, in its own tourism. Indeed, how could they, given that Israel controls all borders and maintains exclusive authority over who can enter and travel about -- and who can’t? This guidebook provides an in-depth, updated journey through the entire range of Palestinian culture: ancient and modern history, archaeology, religion, architecture and politics, including the daily realities of Israeli Occupation. It describes places rooted in Palestinian memory: sites which bear witness to a history and identity created from contact with civilisations of the Middle East, Mediterranean, Europe and Arab Peninsula. It also presents the contemporary tragedy and struggle of a people seeking recognition of their rights and details of their ongoing search for an end to injustice through a viable peace and statehood. A great variety of documentary material, biographies of culturally significant personalities, poems, popular songs and recommended reading list provide readers with opportunities to broaden their horizons, while many contacts provide a range of possibilities for talks or tours with specialists, or meetings with local people in their homes. Palestine and Palestinians presents a version of justice tourism to enhance the world’s increasing interest in the cause of the Palestinian people while providing tools to go beyond misleading stereotypes. Read more.. It is argued that "Tourism aims at bringing nations closer". The story of Palestinian tourism is different. It is one in which Israeli authority denies access to Palestinian sites as yet another way of throttling the Palestinian economy and blocking access to the truth about the real situation in the Occupied Territories. From the Book of Resolutions of The United Methodist Church 2008, pp. 767-769. Copyright © 2008, The United Methodist Publishing House, used by permission. Thousands of people from around the world have undergone top-quality alternative and critical tours for over 15 years through the Israeli Committee Against House Demolitions (ICAHD). The tours are defined by its standards - widely known for its knowledgeable tour guides, its grounded approach to the politics of Occupation, and the difficulties of Palestinian life. On ICAHD tours travellers see how Israel’s settlement project has created irreversible “facts on the ground.” A traveller will better appreciate what a truly just and lasting peace would entail. One gets to meet Palestinian families suffering under Israeli policies of separation and home demolitions. ICAHD believes that first-hand learning is the only way to grasp the social, cultural, political, and historical issues that underlie the Israeli-Palestinian conflict. ICAHD tour guides provide tours in seven different languages: English, Arabic, Hebrew, German, Portugese, Spanish, and French. "In order to understand our reality, we say to the Churches: Come and see." Agencies listed below follow the code of conduct for tourism in the Holy Land and offer different kinds of opportunities to experience aspects of everyday life in Israel and the occupied Palestinian territories and to meet people on both sides of the conflict. Amos Trust: Tours aim to give an understanding of what life is like in the Holy Land today; meet local people; visit the historic and biblical sites; see the “facts on the ground” and experience Palestinian hospitality. A journey for peace with Justice; guidelines for Christians contemplating a pilgrimage to the Holy Land. Friends of Sabeel UK: Sabeel organise Witness Trips each year to Israel/Palestine to: visit the biblical sites; engage with the political and theological issues; meet Palestinians in their own environment; read and discuss the bible together; and learn more of how all of these issues affect the lives of the the Palestinians, the Christians especially. Green Olive Tours: Social enterprise agency providing a wide range of tours that benefit the local community. Israeli Committee against House Demolition (ICAHD): Offers a range of half-day, day, and longer tours, also involvement in rebuilding Palestinian homes that have been demolished. Olive planting and picking tours. Tours, travel advice, Arabic courses, and listing a wide range of agencies offering tours. Palestinian initiative for responsible tourism: A network of organizations advocating responsible tourism in the holy land. See their updated list of resources and groups. Travel Palestine: The official Website for tourism in Palestine. Visit Palestine: Organising pilgrimages, business tours, and cultural and alternative tours. Zaytoun: Olive harvest tours and olive picking trips in October/November. It has become inevitable that Israel will do whatever it takes to steal land from Palestinians for its own profits. Thousands of Dunums have been stolen from Palestinians to create colonies for Israeli’s within the West Bank. However, the new trend of using heritage and tourism to do so is becoming more alarming. It is with religious claims that Israel is using heritage and tourism to pave way for settler land grab. This gives the tourism sector yet another propaganda asset and make-believe notion of how well Israel is endowed and the risks to these ancient sites by 'dangerous' Palestinians.